No Features Selected for Upgrade. Applies to: SQL Server 2005 Express Edition, SQL Server 2008 R2 Express Edition, Windows 7 64-bit. A computer consultant approached me in relation to a failed installation of SQL Server in his laptop. 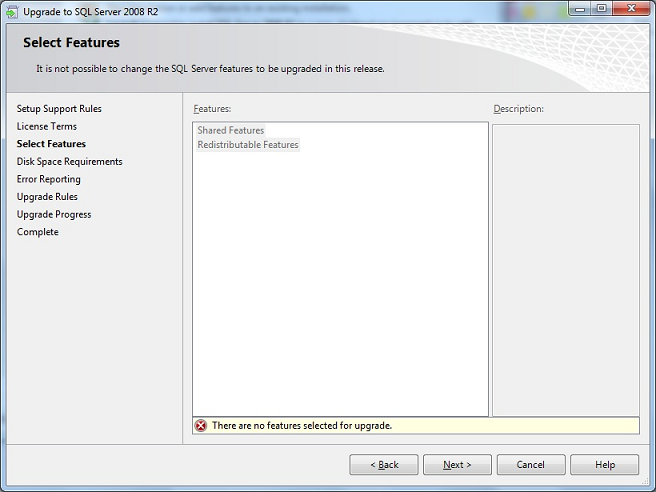 He told me we had tried many times to upgrade the current SQL Server 2005 Express Edition instance installed in his laptop to SQL Server 2008 R2 Express Edition, but the upgrade process always ended with the same error. I asked him to run SQL Server 2008 R2 setup again and show me the error. 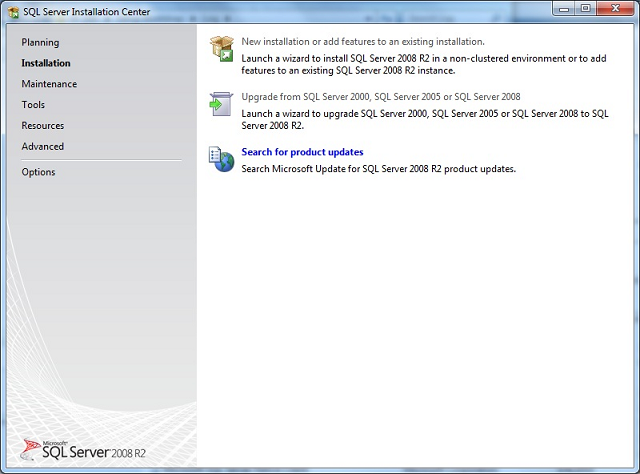 When he ran setup, he chose "Upgrade from SQL Server 2000, SQL Server 2005 or SQL Server 2008" on SQL Server Installation Center and then follow instructions. However, on the "Select Features" page of setup the following error message appeared. bottom of the setup page, then provide valid parameters or click Help for more information. When he clicked OK on the above dialog, a new error appeared at the bottom of the "Select Features" page. There are no features selected for upgrade. Exit message: User has cancelled. The computer consultant was using SQL Server 2008 R2 Express 64-bit (SQLEXPR_x64_ENU) setup program to upgrade a 32-bit instance of SQL Server 2005 Express Edition. Setup cannot upgrade from 32-bit platform to 64-bit platform: cross-platform upgrade is not supported. I ran SQL Server 2008 R2 Express 32-bit (SQLEXPR_x86_ENU.exe) setup program and setup was able to detect the existing 32-bit instance of SQL Server 2005 Express and upgraded it successfully.